…And you know what that means…things start to get a little crazy around here for us, and our partnering organizations as we come together to put on Student CPx trainings in 4 cities! That’s right, we have SCPx opportunities this summer in San Diego, CA. Austin, Tx. Phoenix, AZ. & Pittsburgh, PA. Intentional Gatherings is responsible for hosting two of these four (San Diego, and Austin). If you, or anyone you know is interested in some incredible cross cultural disciple making/church planting training then SCPx is a MUST! To find out more information about a particular city, click the city’s link above. To register for Student CPx Click Here! 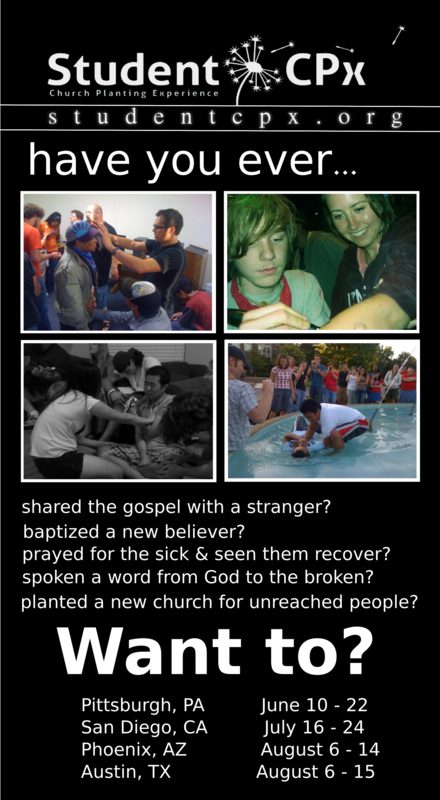 This entry was posted in "church" Planting and tagged aaron snow, brad mckoy, campus church, discipleship, erik fish, great commission, Jesus, love, mike chang, organic church, pam arlund, simple church, student church, student church movements, student cpx, training by aholydiscontent. Bookmark the permalink.